Changed Lives – Prophecy Seminar Makes Alaskans Fishers of Men! 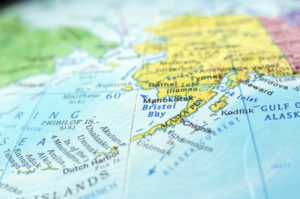 Alaska’s Bristol Bay supports the worlds largest Salmon fishing runs that attracts fisherman from all over the world. Many flood the small town of Dillingham during the Summer months to take advantage of the abundant fishing opportunities. The Dillingham Seventh-Day Adventist Church decided to do some fishing of their own, but this time they wanted to follow the call of the Savior to be fishers of men! As they say there’s never a perfect time to do public evangelism, because the Devil will compete with you every single time. Prior to opening night of the Amazing Prophecies Revelation Series, the handbill mailing was distributed two weeks earlier than expected. The temptation was to panic and conclude that many within the community might forget about the meetings. As pastor Howard Williams lead out in prayer and claiming God’s promises, we witnessed people from the community excited to be coming to the series night by night! Patty Jones came opening night with her Bible in hand to learn more about Revelation and how to prepare for the soon coming of Jesus Christ. What’s interesting is Patty somehow did not receive a flier in the mail, she had a Divine appointment! Nancy met Patty on a morning walk the day the meetings began and decided to muster the courage to invite her. Patty didn’t miss a night! At the conclusion of the series Patty was baptized and excited to join her new church family! Mariano and Kristy attended the seminar nightly. When the Sabbath message was presented, Mariano couldn’t shake the conviction that he and his family needed to be keeping the Lord’s Day. On one Sabbath afternoon he decided to take his chainsaw and hike back in the mountains to cut up some firewood. To his surprise, he couldn’t find any wood laying around anywhere. He then thought “Is God showing me that I shouldn’t be out here on His Holy Day?” The next day he went out again to find wood and sure enough he found more than he needed! Mariano and family decided no matter what, they would keep the Sabbath to honor the Lord. With tears of joy Mariano and Kristy were baptized and happy to join others as well. Noah Lincoln, a resident of a remote village flew with his family to Dillingham to pick up a plane that he had purchased. To his surprise the plane wasn’t ready to fly until another 3 weeks, just long enough for Noah and family to attend the seminar! Noah and family attended most of the seminar and gladly accepted the truths they were hearing. After their baptism Noah said “There are no Seventh-day Adventist in my village, we will be the first to take the Three Angels Message home to our people! At the conclusion of the series held by NPUC Evangelist Jason Morgan, the Lord blessed the Dillingham SDA church with 21 baptisms! If we are willing to work and do our part, God is more than willing to use us in taking the Everlasting Gospel into all the world. Just ask Noah! Comments Off on Changed Lives – Prophecy Seminar Makes Alaskans Fishers of Men!